Videos are getting clearer with HD/4K UHD becoming prevailing in cameras, mobiles, capturing devices, and 8K resolutions around the corner. However, the huge sizes of higher resolutions are placing greater challenges on the internet, requiring faster internet connections to upload, download and stream videos smoothly nowadays. For example, a 10-minute video recorded with iPhone X may go up to 1~2GB, way out of the acceptable size of websites, web browsers and HTML5 background. Because of this, we will need to compress video for web upload in most cases. Why do you need to make videos smaller for webs? The first thing to consider is the internet speed. Let's see how much bandwidth connection is required to stream a 10-minute iPhone video, which is recorded at 4K 60fps in HEVC. The internet speed of 80% average households in America is about 15Mbps. The country's capital city and a few other metropolises have faster internet connection, ranging from 23.8Mbps to 28.1Mbps. Apparently, too large videos are beyond the cap of most web internet in US. That's why many people experience buffering, frozen or unresponsive problems when uploading or streaming higher resolutions. If you upload 4K UHD videos to web, reduce video size for web can relieve the stress on internet and help the videos reach faster to its audiences. In consideration of the internet speed, websites impose size limits on the videos to be published. If you're sharing videos on certain websites, you will need to compress video to websites' size limits. For example, Vimeo allows 500mb at up to 30fps for basic plan; Facebook allows a maximum of 1.75 GB and 45 minutes; and Vevo allows 512mb at up to 30fps. Before you upload any videos to those websites, make sure you shrink the video size to web's limits. What Software will Compress Video for Web with Good Quality? Today's 4K videos and even 8K are asking for a higher level of compression due to the larger size produced by the increased pixel data and higher bit rate. As everyone knows, higher the level of compression means greater quality loss. According to an internal survey, what users care most about is the output quality, followed by the speed. Any software can reduce video size for web HTML5 background, websites, browsers fast without losing quality? 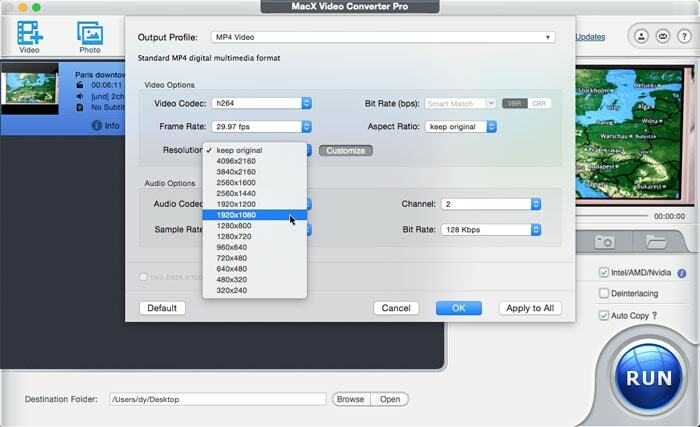 Yes, MacX Video Converter Pro is a good one. 1. Shrink videos from any sources, including 4K UHD videos from camcorders, GoPro, DSLR cameras, webcams, iPhone, iPad, Samsung, other devices. 2. Advanced controls over the video/audio codec, bitrate, framerate, resolution, parameter, playback platform, upload site etc to optimize video for web. 3. Bundled with a plenty of editing options to trim the video length, remove the unwanted parts, and do other editing. 4. World's unique support for 3-Level Hardware Acceleration tech (Intel/Nvidia/AMD) has the fastest speed for HD/4K/8K video resizing, while avoiding the overheating problems on computer. 5. Advanced High Quality Engine and HW compressing ensures the top output quality, 98% quality reserved. How to Shrink Videos for Web on the Internet? Launch the software and click the load button with a + icon to load the videos to be optimized for webs. Once the video is loaded, a window will pop up asking you to choose an output format. The best format for web is H.264, which balances well between size and quality. However, if you're uploading HD/4K/8K videos, H.265 will help save 50% size. Other video formats like WMV, 3GP, FLV work well with certain sites (to know which format has the smallest size, check the guide on shrinking videos for WhatsApp, where size differences are detailed). Also you can choose the ready options for YouTube, FaceBook, Vimeo, etc. Changing the video settings is a common way to reduce video file size for web. To do this, click the video parameter setting button with a gear icon . On this page, you can change the parameters to make the video smaller for web upload. If you don't know how, look below. * Bit rate - Bit rate will affect the output size directly. Faster motions and higher resolutions will require higher bit rate. Below is the recommended bitrate for videos of different resolutions. For web steaming or upload, you're suggested to choose the standard bit rate, which has smaller size and faster upload speed. * Resolution - It's the best to adjust the resolution based on the video source. If you lower the resolution too much, it will result in degraded image quality or corrupted recordings. It's safe to lower the resolution by one level below the original resolution. For example, if the source video is recorded at 4K 2160P, you can adjust it to 1080P. * Frame rate - Higher frame rates help record slow-motions. If the video is recorded at 120fps or 240fps, 60fps at high resolution can achieve the same effects. Normally, 24 or 30fps is good enough for normal footages. One of the most efficient way to squeeze video size for websites is to make the video shorter and remove any unnecessary parts from the video. To do this, click button go to the editing page. * Trim video length - click Trim and enable the Trim box. You can enter the exact starting time and ending time, or move the mouse on the progress bar to adjust the video length. If the video is too large to be shrinked for web's size limits, like a long video shot at 4K 60fps, you can also split the video into shorter pieces this way. * Remove unwanted parts - Click Crop & Expand and enable Crop box. You can enter the exact number for the position, height & widt, or move the mouse on the screen to decide the area you want to reserve. Now click the Run button to apply all the compression settings. To ensure the fastest speed & highest output quality, don't forget to toggle on the hardware acceleration and High Quality Engine on the interface. The program is especially fast to compress HD and 4K UHD videos. 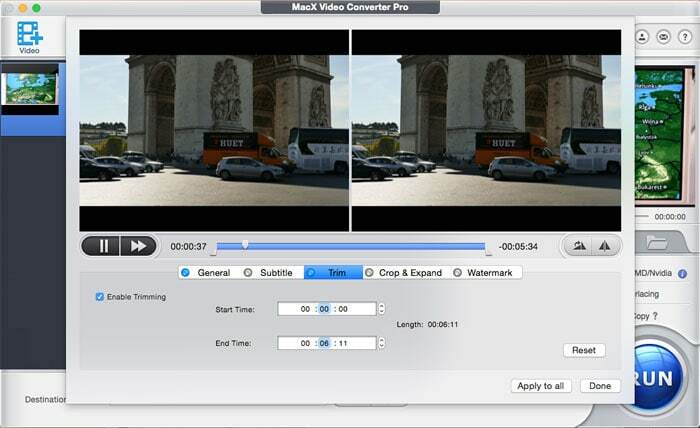 For example, 4K video shrinking for web may get the computer overheat with other sophisticated compressing software, the same problem is avoided with MacX, as it takes full use of computer's idle hardware to do what it excels at. Whether you want to make videos smaller for websites or web HTML5 background, follow the steps above can get you there. Although we have guides for different sites here. If you don't know the specific size limits for different websites, or want to know the detailed guide to reduce video size for different webs, you can find the tutorials in the the posts below. 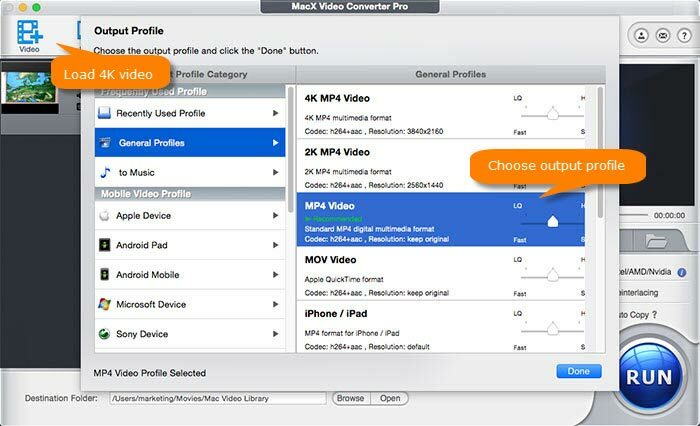 MacX Video Converter Pro is able to make video size smaller for webs, be it 4K UHD videos from GoPro, DLSR cameras, iPhone X, or HD 1080P/720P, SD videos recorded by webcams, other mobiles. It can shrink the video size by 70% for webs by transcoding video codecs, changing resolution, bitrate, aspect ratio, frame rate, trimming video length etc. Uploading A GoPro Videos to Web? Shrink It Now! Best HD video shrinker with fastest speed & top quality. Guide on how to make MP4 videos smaller. Any free tools to cut down video size? Check here.